Antique ice boxes bring a sense of nostalgia to nearly everyone, even those whose only experience with one has been through movies. Civilizations have been harvesting and using ice for keeping food fresh since before Roman times. One of the earliest known ice houses is reputed to have been built in Iraq in 1700 B.C.. Thick chunks of ice would be cut from the ice that formed on lakes and ponds and taken to these structures. Icehouses were generally squat, domed buildings. The foundations were dug deeply and the walls were mostly underground. This helped the building stay insulated. During the winter snow would be brought into the ice house and used with sawdust or straw to keep the huge blocks of harvested ice frozen. This method was so effective that the ice was often still frozen the next winter. Perishable foods and beverages would be kept in the building and chunks of ice would be chipped off to create ice cream. As technology increased so did pollution. The clean, clear ice that may have been harvested from the local pond became tainted with chemicals and other residues. Ice began to be created commercially. Since it was not feasible for everyone to have their own ice house, the ice box was developed sometime between 1830 and 1840. It was little more than a wooden box with an area to hold a block of ice. Over the next few decades improvements were made to the original design. The average ice box was made of wood. As time went on these utilitarian appliances became beautiful pieces of craftsmanship. There were often carvings and other embellishments added to the basic box. Near the top of the box, in the interior, was an area to hold a big block of ice. In some models it was a tray and in others it was a wooden compartment. Later and more expensive models would have a rubber tube that was attached to the bottom of the ice compartment. This drained the water from the melting ice into a holding tank or a pan under the ice box. It was the job of the homemaker to remember to pour out the panful of water every day before a puddle formed on the floor. For a century the ice man was a daily visitor to many homes. He would deliver ice, securely insulated in sawdust, to each ice box. This daily activity was met with delight from the local children who would take ice chips from the wagon in the summertime. Today these vintage ice boxes are in demand by collectors everywhere. They are used as side tables, cabinets, and storage in many vintage style kitchens throughout the country. They bring a touch of the old country kitchen into the modern world. 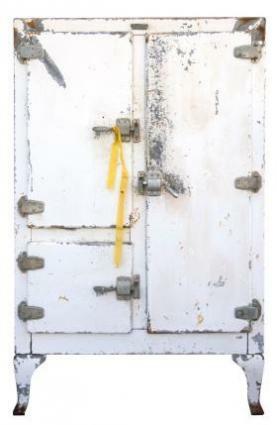 You may come across an old ice box as a local thrift shop, garage sale, or flea market but it is unlikely. Generally these are snapped up by those that know their true value. More often you will find them at antique stores and auctions, or on the Internet. Antique ice boxes are a wonderful addition to any vintage kitchen. By keeping it out of direct sunlight and keeping the wood moisturized it will last a lifetime. Like the pie safe and the dry sink, the ice box is a reminder of a simpler, less complicated time.